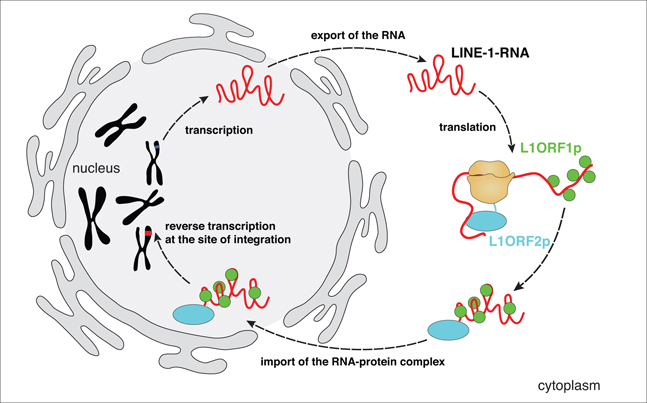 Life cycle of a retrotransposon. See full size version of illustration. Transposons, or "jumping genes," make up roughly half of the human genome. Geneticists previously estimated that they replicate and insert themselves into new locations roughly one in every 20 live births. New results, published in the June 25, 2010 issue of Cell, suggest that every newborn is likely to have a new transposon somewhere in his or her genome. "Now it looks like every person might have a new insertion somewhere," says senior author Scott Devine, PhD, associate professor of medicine at the University of Maryland School of Medicine's Institute for Genome Sciences. "This is an under-appreciated mechanism for continuing mutation of the human genome." The research was initiated at Emory University School of Medicine, where Devine was in the Department of Biochemistry. First author Rebecca Iskow, PhD (now a postdoctoral fellow at Brigham & Women's Hospital in Boston) was a graduate student at Emory. Two other papers on human transposons appear in the same issue of Cell. Transposons resemble e-mail spam: short repeated sequences that have no obvious function other than making more of themselves. The full name for the type of transposon that is most abundant in the human genome is retrotransposon. The "retro" term comes from how they replicate: first, the DNA is transcribed (copied) into RNA, and the RNA is reverse-transcribed into DNA again. This process normally only happens during very early in development, when the cells that will become eggs and sperm have not turned down a separate path of differentiation. "Transposons are the original selfish genes, and this strategy makes sense for them, because it makes sure new copies will get carried into the next generation," Devine says. While working in Devine's lab as a graduate student, Iskow devised a technique for "amplifying" the stretches of individual genomes that border transposons and reading thousands of the junctions with advanced sequencing techniques, then comparing them to the reference human genome. "The basic problem was that a new insertion can be anywhere within three billion base pairs - how do you find it compared to all the other ones?" Devine says. Ninety-seven percent of genomes the team surveyed had at least one rare insertion of the L1 variety of transposon that was present in only a single human in the study, and some genomes had several. Since the study surveyed 76 genomes, "rare" insertions could still be shared by large groups consisting of thousands of people. Rare insertions corresponded to the most recent transposons, which are less likely to have their jumping abilities impaired by other types of mutations. Devine's team also showed that transposons frequently jump to new locations during the process of tumor formation in lung cancer. Surveying 20 lung tumors and comparing their genomes against the normal tissues they came from, the team found that six tumors had new transposon insertions that were not present in the normal adjacent tissues. Several scientists from Emory's Biomolecular Computing core facility and the Winship Cancer Institute of Emory University were involved in the research. Paula Vertino, PhD, professor of radiation oncology in Emory School of Medicine and study collaborator, says the work helps to clarify the relationship between DNA methylation and retrotransposition. By analyzing the patterns of DNA methylation in the same lung tumors, Vertino's group found a correlation between the loss of DNA methylation in the tumor and the likelihood of finding a transposon that had jumped. "The modified DNA methylation patterns may be allowing transposons to re-awaken, and could be a significant source of new mutations during tuor formation," she says. Transposons can inactivate tumor suppressor genes and can facilitate rearrangements that involve large stretches of chromosomes. Geneticists have already identified many transposons that interrupt genes and cause human diseases, including neurofibromatosis, hemophilia and breast cancer. Scientists believe a process called methylation, which silences genes during differentiationalso shuts off transposons' ability to jump. Analyzing the patterns of mutations in the lung tumors suggested that during tumor formation, modified methylation patterns may be allowing transposons to re-awaken, Devine says. The research was supported by grants from the National Human Genome Research Institute, National Cancer Institute, the American Cancer Society and Sun Microsystems. R.C. Iskow, M.T. McCabe, R.E. Mills, S. Torene, E.G. Van Meir, P.M. Vertino and S.E. Devine. Natural mutagenesis of human genomes by endogenous retrotransposons. Cell (2010).